Blanchard, Olivier, “Adjustment within the Euro; the difficult case of Portugal”, mimeo MIT. 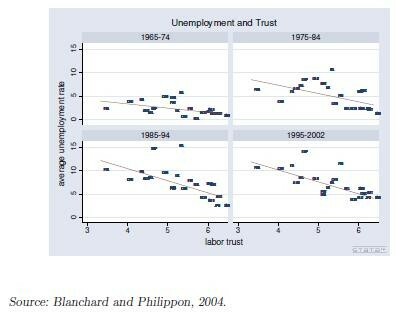 Blanchard, Olivier and Thomas Philippon, ”The quality of labor relations and unemployment”, NBER working paper 10590. 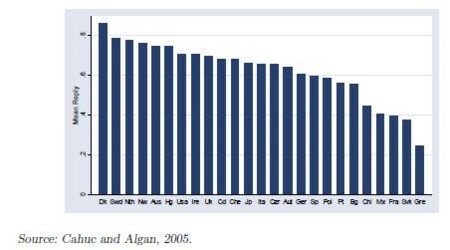 Cahuc, Pierre and Yann Algan, ”Civic attitudes and the design of labor market institutions: Which countries can implement the Danish Flexisecurity model? ”, mimeo Paris I, September. Foster, Lucia, John Haltiwanger, and C.J. Krizan, “The link between aggregate and micro productivity growth; Evidence from retail trade”, NBER working paper 9120. Timmer, Marcel, Gerard Ypma, and Bart van Ark, “IT in the Euro-pean Union: Driving Productivity Divergence?”, Research Memorandum GD-67, Groningen Growth and Development Centre, October.